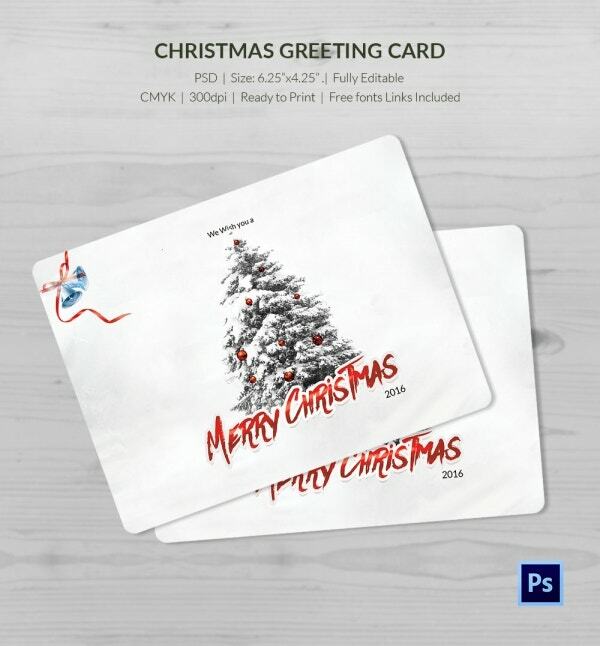 When it comes to wishing Merry Christmas to friends, family, and business relations, a greeting card is a must. 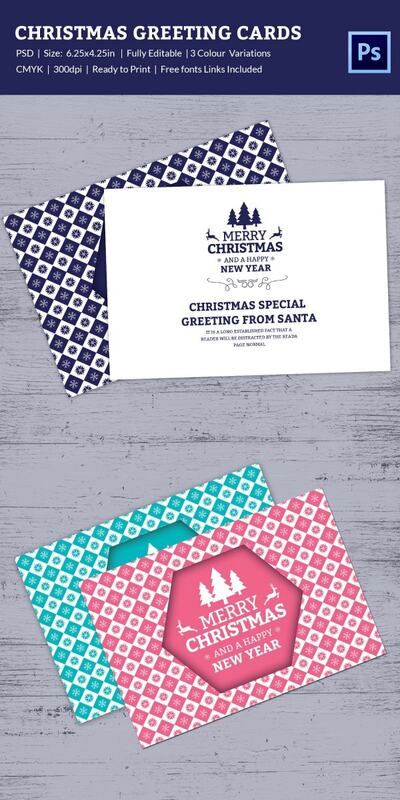 Most of them come up with a smiling Santa carrying a sack full of amazing Christmas presents while some of them present a beautiful collage of all the defining elements of the holiday season- like a snow white backdrop, brightly decorated Christmas tree, socks, snowman etc. 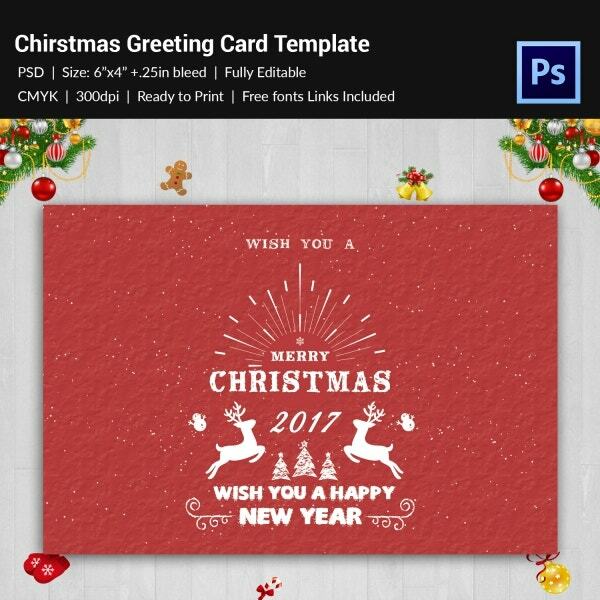 If you are too busy to design the Christmas greeting card by yourself, there are pre-designed customizable Christmas greeting card templates online. 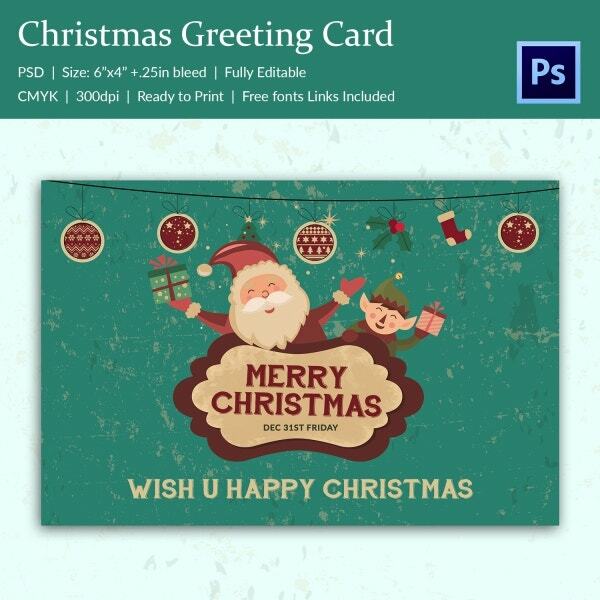 With the happy Santa singing Merry Christmas with a great Christmas present, flanked by a joyous kid, the greeting card assures a beautiful way to send your greetings for the holiday season. 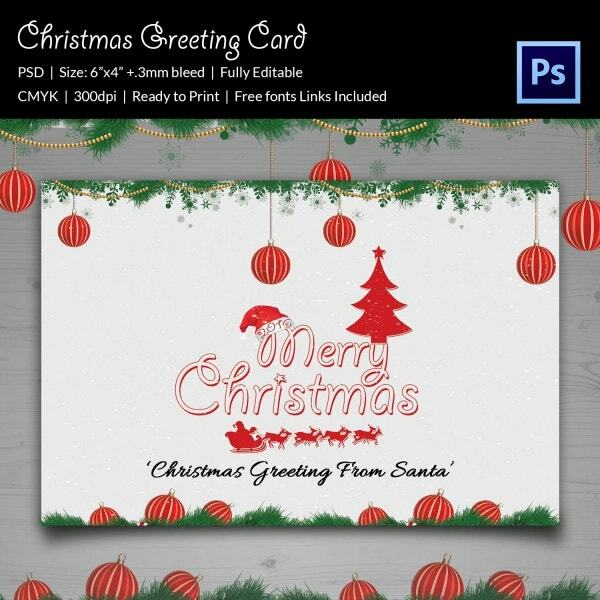 You have a bright Christmas and New Year greeting card here with glitters all around. The embellished Christmas tree on the left has rendered the much-needed color to the picture. The red sledge merrily carrying across the Santa instantly reminds of all the amazing memories of the great Christmas spirit. The Santa cap, Christmas tree and the decorative balls further complete the drama. 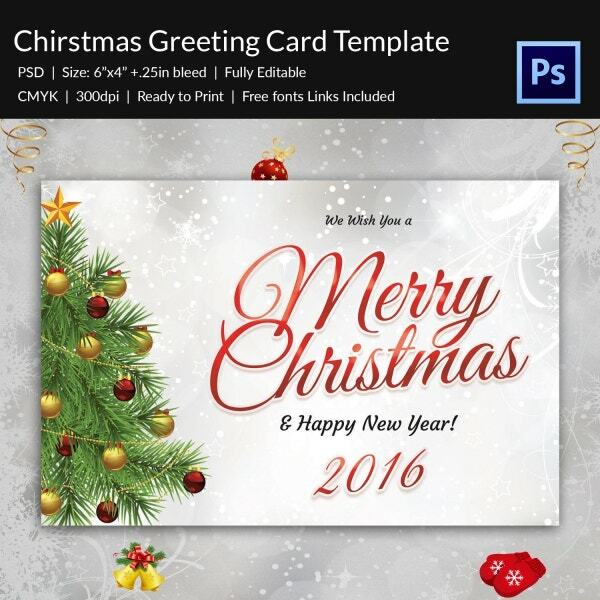 If you are looking for a greeting card that can wish both Merry Christmas and Happy New Year, this card would be awesome for you with its snow-capped Christmas tree, snow-white backdrop and the bright star. 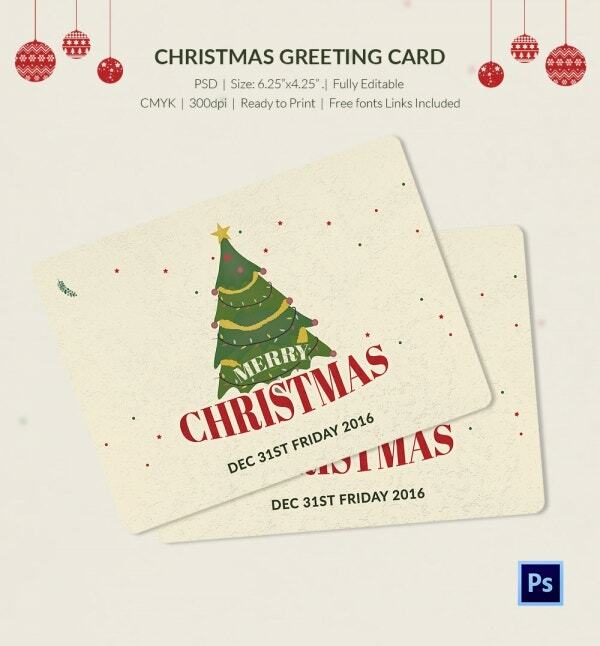 If you are in search of a minimalist greeting card invitation that can elegantly present the joyous spirit of the holiday season without being too extravagant, this greeting card does the job with its Christmas bells and a classy navy blue backdrop. 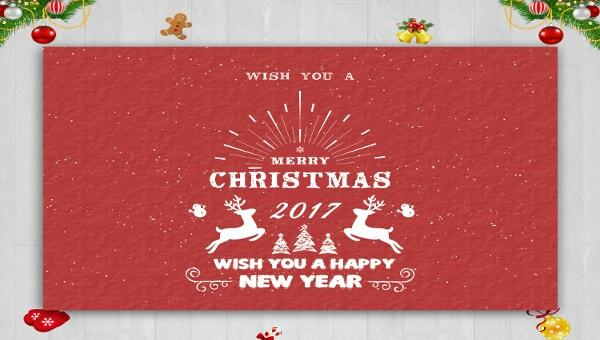 The red present all over speaks of the vibrant message of joyous Christmas from every corner of the greeting card- not to forget the typical Christmas elements like the Santa, the presents, the snowman, etc. 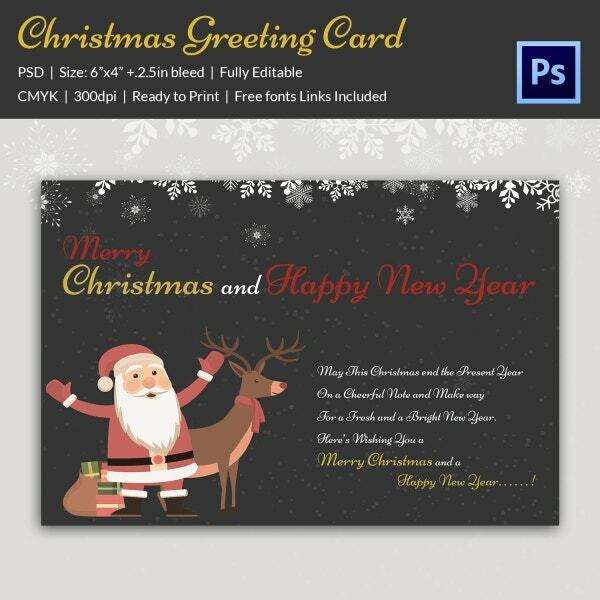 With the snowflakes hanging from the top and the merry Santa declaring a joyous Christmas with great Christmas presents and a reindeer, you have an elegant Christmas and New Year greeting card for you. 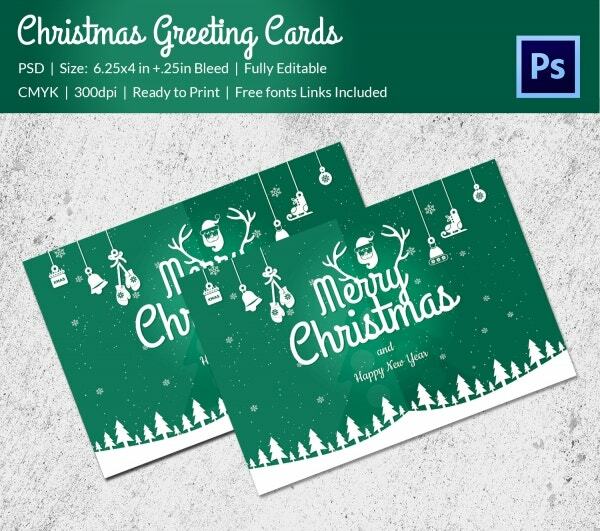 You have a neat classy Christmas greeting card here with the message of great fun and merry making right from the ever-smiling Santa. The Christmas tree silhouette adds a dramatic touch to the overall picture. 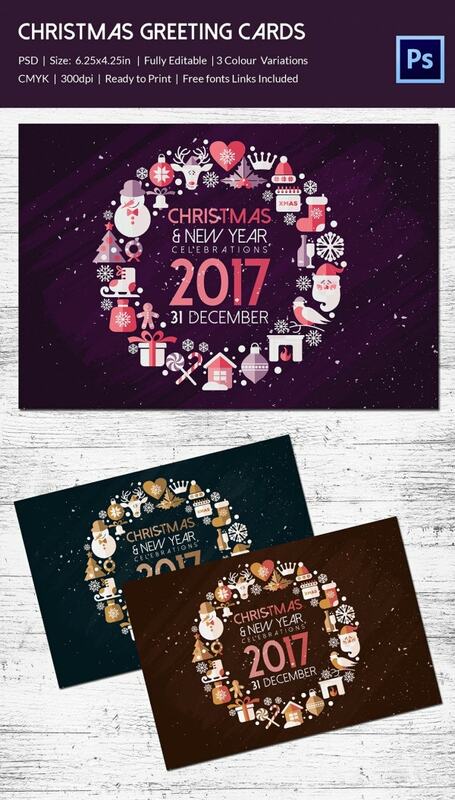 This adorable Christmas greeting card has come up with a beautiful collage of all the typical props of the holiday season, ranging from snowman, present, Christmas tree and so on. 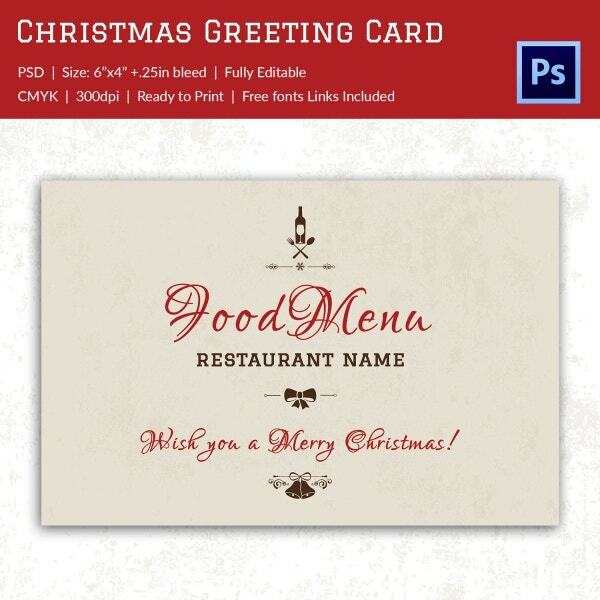 This Christmas greeting card would be great if your restaurant is planning to launch some special menu this holiday season. Now you have a wonderful way to spread the word about it. 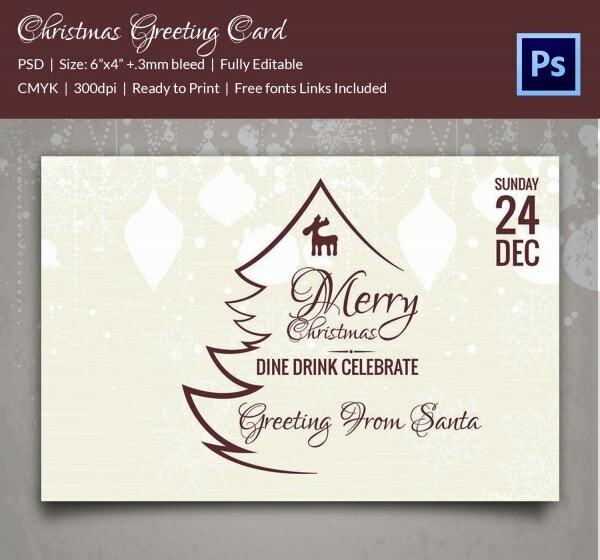 > How to use the Christmas Greeting Card templates? 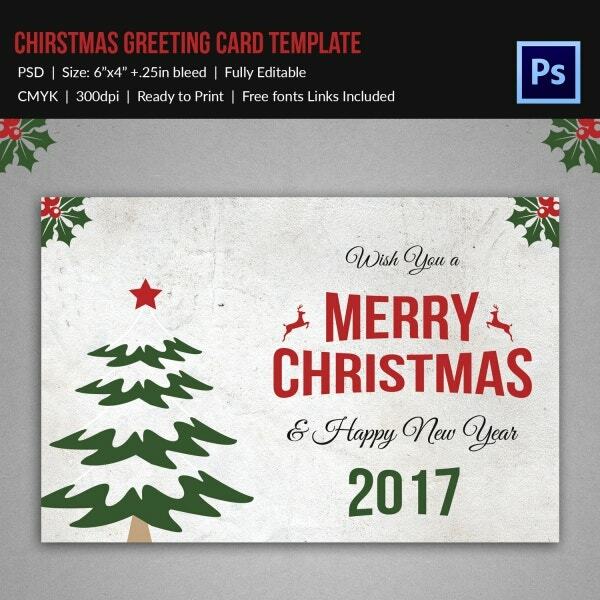 When it comes to the holiday season, it’s always beautiful to send your merry greetings through Christmas greeting card templates. 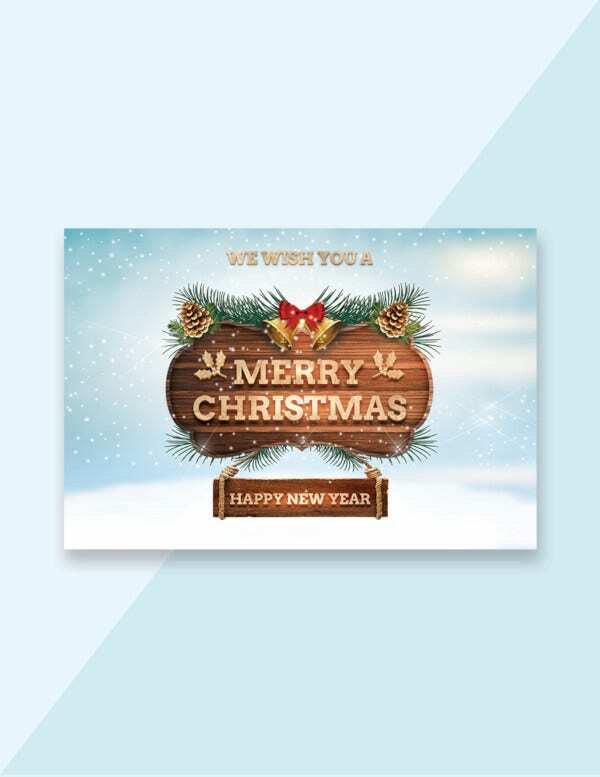 You can use these card templates to send warm greetings to your family and friends as well as to you colleagues and clients. 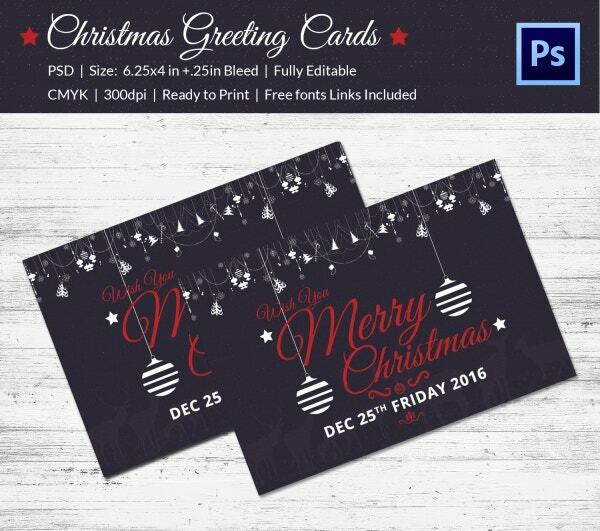 If you are launching any special menu or some new-age service/product this Christmas, these greeting cards can be duly used to pass the word about it. 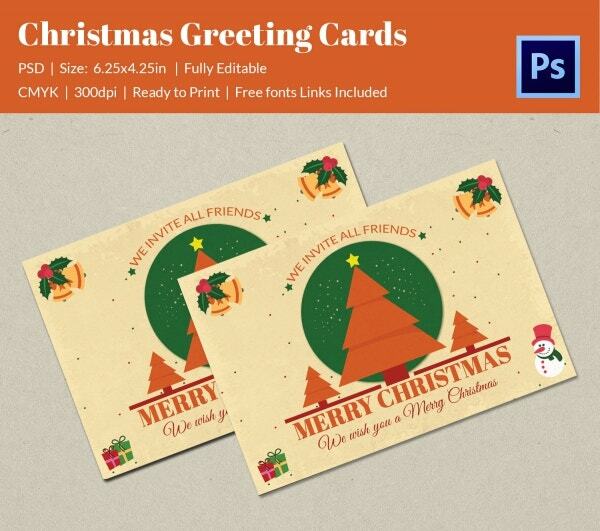 You can also use these cards to inform your potential audience about your Christmas discount offers. 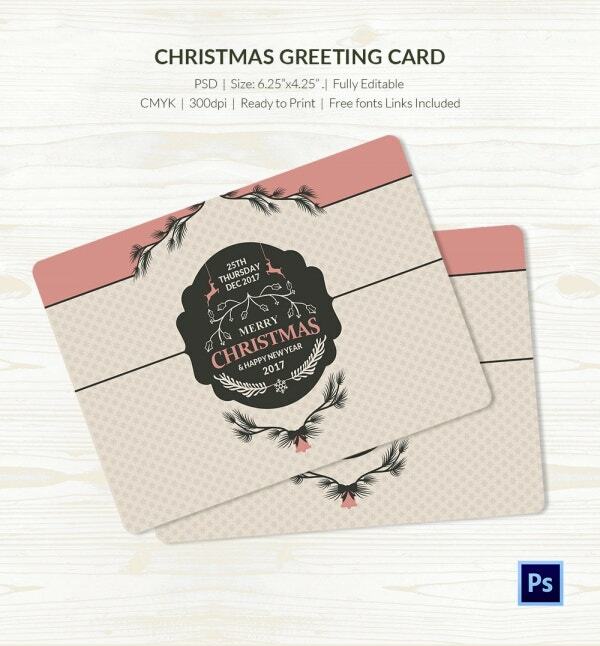 The Christmas greeting card templates come in various styles. 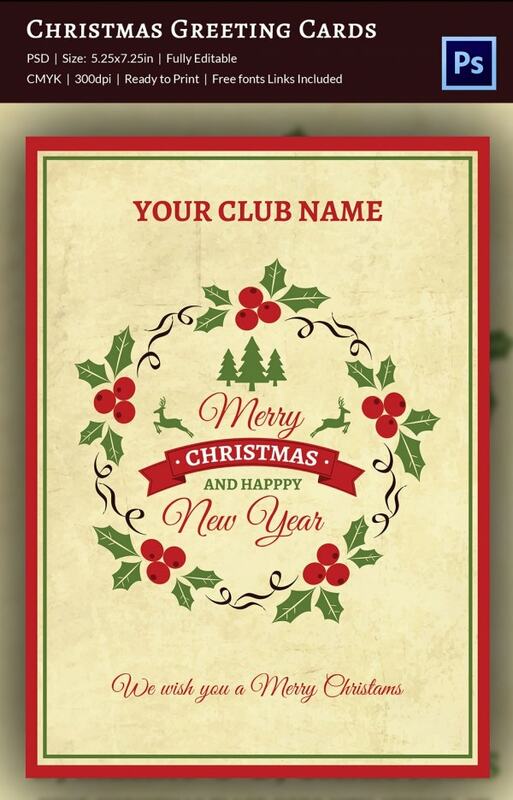 Just download a preferred one, customize it with your typical message and get it printed out. 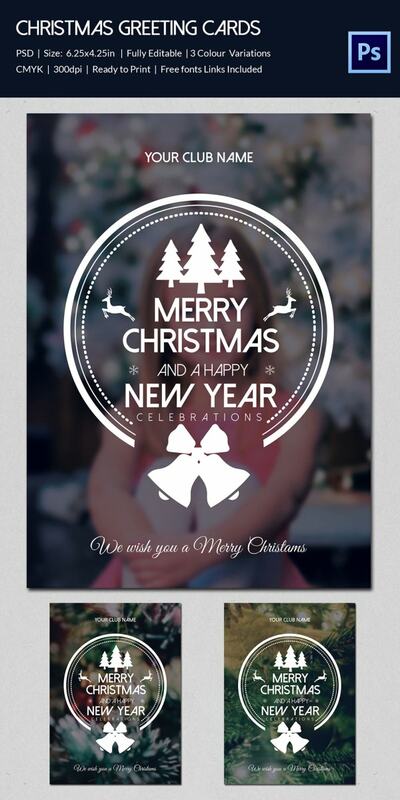 You may also see Christmas Thank You Card Templates. 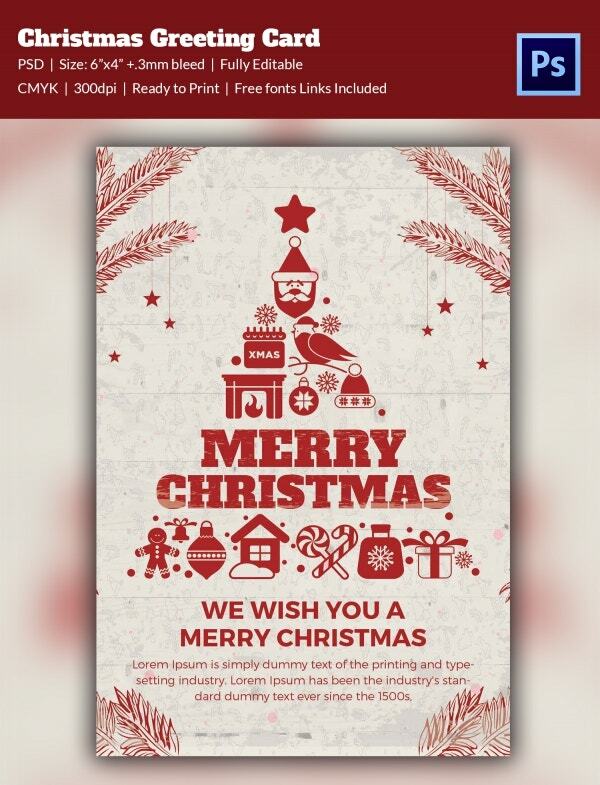 You have a mindblowing collection of Christmas greeting cards above. 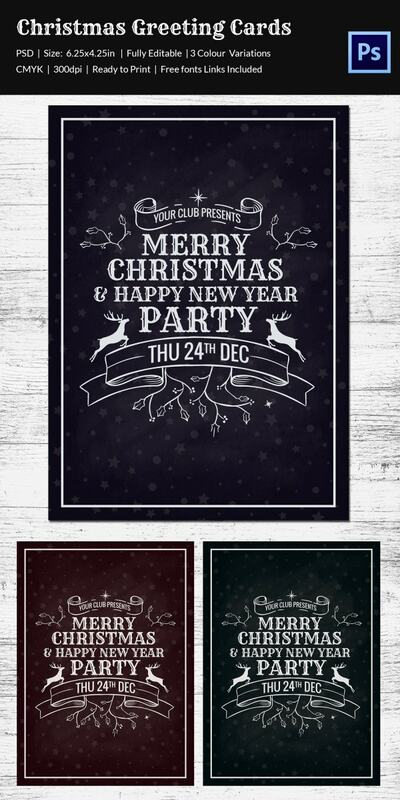 Each of them has duly captured the joyous spirit of Christmas in different happy moods and you are sure to find one that matches your specific taste. 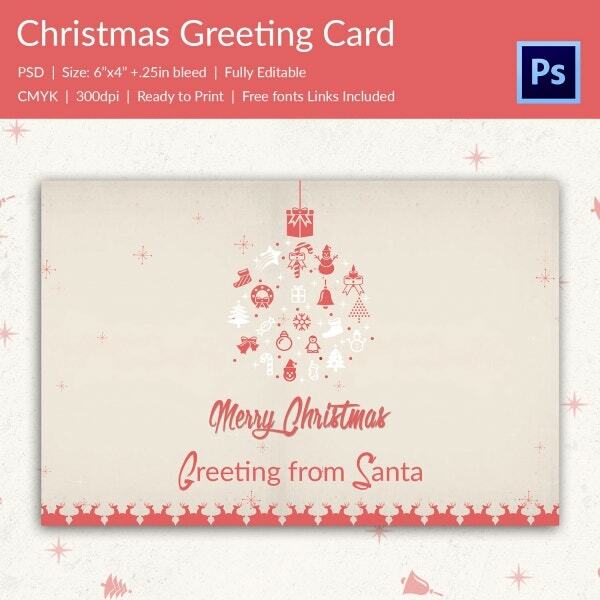 A good lot of them are for both Christmas and New Year greetings.